These "lessons" are going to involve 4 things, different each time! 4. Doing a tension swatch...and there are not as many ways to do this, so after we cover all the ways that we can come up with, it will be up to you to choose your method for the future. AFTER we do them the different ways, I will let you know when you can do it your way!!! We are going to do a swatch for each type of knitting, and it only makes sense to do it as a tension swatch, so you can practice that as well, and you can learn how to measure each type of knitting. We are also going to learn different ways of cast on, as well as binding/casting off. Material needed: main color of yarn(MC), and a similar weight of waste yarn(CC), in a very different color. One other point I need to make....these swatches assume you have a standard gauge machine. 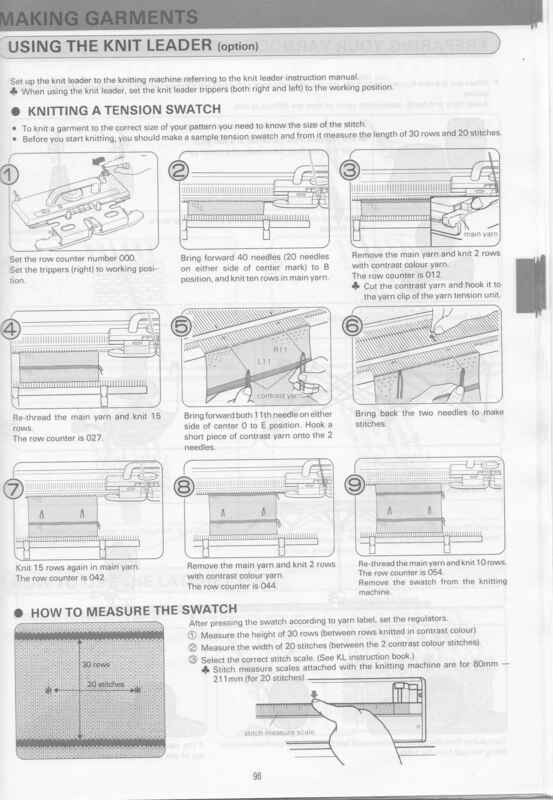 If you are using a bulky or a mid guage machine, please check your manual for number of stitches to cast on....on the bulky it is most likely 30 stitches, not sure what the recommendation is for a mid-gauge. Please make your sample/swatch accordingly. If you are right handed, start with the carriage on the Right. Pull 60 needles out to hold position(all the way out). Set the cam for plain knitting(also make sure it will knit the needles in hold). Make a slip knot in the yarn and place this slip knot on the needle farthest to the left. Now you are going to wrap the needles, making it look like you have written "e"s by doing this: Start with the next needle on the left, bring the yarn under it, over the top of it and back down the left side of that needle, then continue by bringing the yarn under the next needle, up the right side of the needle, over the top, and down again on the L side of the needle. Continue this technique across the bed, making sure you use your left thumb or index finger to keep the stitch from sliding off. Make sure you do NOT wrap too tightly. The above website shows very clear instructions with pictures on how to ewrap...please take a look at it. Now, put the yarn into the carriage(close the gate if you are knitting with Brother or KnitKing) and knit from R to L. Pull those needles back out to hold, being very careful not to let the stitches "ROLL" OFF the hooks. Knit back to the right. Knit with this method for at least another 4-6 rows until the knitting is long enough to hang your weights on the knitting. (This method eliminates the need for a cast on comb, but if you feel you need to use the comb, go ahead). Pull out needles # 21 each side of 0. Use a length of CC yarn approx 3 inches long, fold in half, and using the hook of the needle, knit this stitch back into place with the contrast yarn. Knit 2 rows of CC yarn. Knit approx 8 rows of MC yarn. Now, you need to make eyelets denoting the number of your tension dial: example T8 = 8 eyelets. these are made by transferring a stitch to the adjacent needle and placing that empty needle back into working position. Knit approx 8 more rows . If you have a Tension such as 8.2(two clicks past the 8) make your 8 eyelets on one side of the swatch, and then on the other side, make 2 eyelets to denote the 2 clicks. Remove the yarn from the carriage and hold it in your L hand. Pull the needles to hold. Take the yarn in your hand around to the right of the last needle on your right around the gatepeg. Take the stitch on the far right onto your latch tool and place behind the latch. Grab the yarn with your latch tool and pull it through the stitch. Now take the next stitch onto your latch tool, and pull the yarn through the stitch. Continue this method across the rest of the needles, keeping the gatepegs in the middle of your knitting so that it is cast off evenly. Check your manual for this instruction and make note of the page number here____________ so you can find it in the future. Pull the yarn through the last stitch, and cut off leaving a tail as desired. You have now made your first swatch, a tension swatch, in Stockinette. Steam it as you would treat a garment made with that yarn. You may wash it too if you wish. remember, a true tension swatch must be treated EXACTLY as you will treat the garment for you to get an accurate gauge. Click here to be taken to another website that shows a very clear demonstration of how to do the e-wrap cast-on. Double click on the above picture to view it in larger format.